1 Tablet or 10 ml three times a day for time equivalent to three consecutive cycles, therapy to be continued even during menstruation. 2. Satyavati GV et al. Further studies on the uterine activity of Saraca indica Linn. Indian J Med Res. 1970 Jul; 58(7):947-60. 5. Anonymous, Dhanvantari Vanaushadhi Visheshank (Hindi), ed. K.P. Trivedi, Dhanvantari Karyalaya, Vijayagarh, 1971Vol. VI, PP.168-171. 8. Gaitonde BB, Jetmalani MH. Antioxytocic action of saponin isolated from Asparagus racemosus Wild (Shatavari) on uterine muscle. Arch Int Pharmacodyn Ther. 1969 May;179(1):121-9. 10. Saraf A P. Dept. Pharmacology G.M.C. 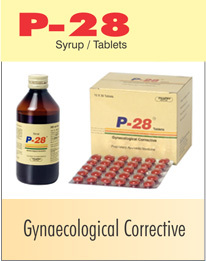 & J.J. Group of Hospitals In-vitro investigations of P-28 an ayurvedic menstrual corrective on the uterine and other smooth muscles. Data on file.